I am very conflicted about how to deliver my final verdict on Selma. It is no doubt a very important film and accurately depicts a snapshot of American history that more people need to know about and discuss, especially in the wake of the events in Ferguson, Missouri and Staten Island, New York. People should see it, be aware of this tragic chapter in the Civil Rights movement and discuss it with friends, family, and colleagues about how it impacts us today. Teacher’s should and will show this picture for years to come along with Remember the Titans (2000), and 42 (2013). This era of history was not that long ago many people are still alive and remember 1965 right before the Voting Rights Act was passed. The events illustrated in Selma are relevant today due to the fact that racial injustice is still very much alive is a sad tragedy itself. One of the strongest parts was the acting in particular the supporting roles. David Oyelowo was good but limited as Dr. Martin Luther King, I’ll get to why I felt he was restrained a little further down. Oprah Winfrey was not distracting the way I felt she was last year in The Butler. She played her small role very well and blended in with the other marchers. Tim Roth did a nice job as George Wallace, the Governor of Alabama during the Selma marches and I also liked Stephan James a lot as a young activist who would grow up to be the great Senator John Lewis. The strongest performance I actually thought was Tom Wilkinson as President Johnson. His character I thought was the most complex because as a history buff I always loved Lyndon Johnson but Wilkinson adds layers of depth to our former President by showing his disinclination to help Dr. King and simply provide him lip service. He played Johnson in a very gray area, not quite the hero but also not a clear villain of Civil Rights, a president that was very conflicted. The most powerful frame in the movie is a discussion between King and Johnson in the White House where a portrait of George Washington is right between them, as if his specter is looming over our two characters making you wonder, what would our first President do during these challenging times (remember Washington was a slave owner from Virginia). So why am I so reluctant to recommend Selma to all of you reading here at Panandslam? For the moments of greatness this picture showed, it had equally as many moments where it wallowed in mediocrity. I did not feel the characters were complex enough, nor was the deep complexity of the non-violence in the Civil Rights movement. The planning scenes were good but very safe. The marches and riots were adeptly recreated but nothing else. My biggest qualm is with Ava DuVernay’s lazy direction. I feel she was way out of her element with a production and script of this magnitude and it would have been much better in the hands of a more experienced director like Oliver Stone (who was originally supposed to direct) or someone like John Singleton or Spike Lee. All three of those directors have made pictures that emotionally moved me and were not afraid to play it safe. DuVernay’s shot selections were not compelling. There was one moment where I was looking up Martin Luther King’s nose and did not care what he was saying. Plus she really fell in love with the back of her lead actors neck. I was sick of looking at the back of his neck while he was speaking. What could have been memorable scenes I found annoying because I felt like I was looking at the back of the same guys head for half of the movie. Oyelowo might have been great as the most iconic Civil Rights leader in history, but I was frustrated so much looking at him from behind his performance was lost. Even though this is the first major picture to touch on Martin Luther King’s infidelities, I still thought Selma was overly safe. Those scenes felt forced and unconvincing straight out of a Lifetime movie. They were not nearly as compelling as the scenes involving the planning of the march and the triangle chess match between Dr. King (David Oyelowo), President Lyndon Johnson (Tom Wilkinson) and Governor George Wallace (Tim Roth, all British actors). The real reason that I am very marginally not recommending Selma is because of the fact that in the end it did not emotionally move me. There was no hard punch to the gut that films like Malcolm X (1992) or last years Best Picture Winner 12 Years a Slave gave me. It stated the facts accurately, added some human elements and then was over. It was the equivalent of watching the part on the Selma march from the documentary series Eyes on the Prize. That is what Selma boils down to, a good, but not great dramatic recreation of the Selma episode from Eyes on the Prize. If you have not seen that documentary series you should get your hands on it and watch it immediately it is primary source history that you will never forget. 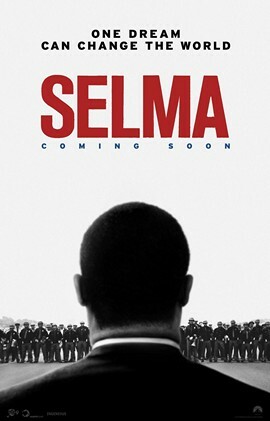 In the meantime if you feel you must see Selma in the theaters then I do not want to deter you, but I will say that there are much more emotionally powerful pictures at the cinema right now. Below you can watch the Eyes on the Prize episode “Bridge to Freedom-1965”. It is extremely powerful because it is real.